Heat a cast iron pan to medium-high, rise 4 asparagus and cut into thirds. Lay on the bottom of the pan and cook without oil or water until tender, turning so it browns evenly. Slice 8 cherry tomatoes in half and toss in and cook for 2-3 minutes with the asparagus. Remove from the pan, and wipe the pan clean with a paper towel. Cut two boltllos in half and lay them on the cast iron pan, turning the heat down low. Put a lid on and let them toast. The lid will help them heat all the way through, not just on the toasted side. In another pan, on medium-low heat, melt 1 tbsp of butter. Meanwhile, beat 3 eggs with 1 tsp of dry dill weed. Do not add salt and pepper. Pour into the melted butter and scramble. This is a soft scramble, which makes a creamy, tender scrambled egg. It’s imperative you add no salt until the eggs are done or they won’t get the creaminess you want. Stir constantly until the eggs are cooked to a creamy consistency. Then add some salt and pepper. Remove the now toasted bolillos, spread the eggs on the pieces, then place some asparagus and tomatoes on top. These are a delicious blend of flavors, the creamy soft-scrambled eggs are wonderful foils for the asparagus and tomatoes. 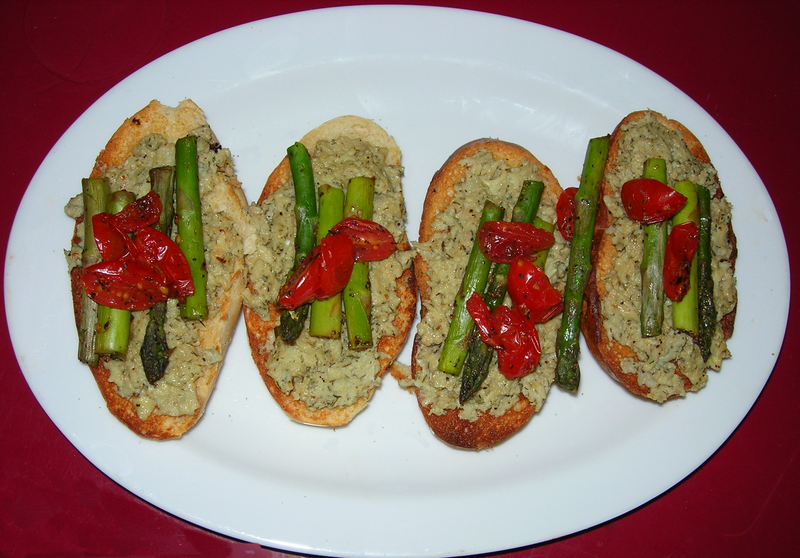 The crunchy bolillos are a good contrast in texture to the creamy eggs, juicy tomatoes and the semi-crisp asparagus. These make a nice light meal or great snack. I made the couscous using the leftover broth from cooking farro just to add the richness of the vegetable broth to give it a deeper flavor. 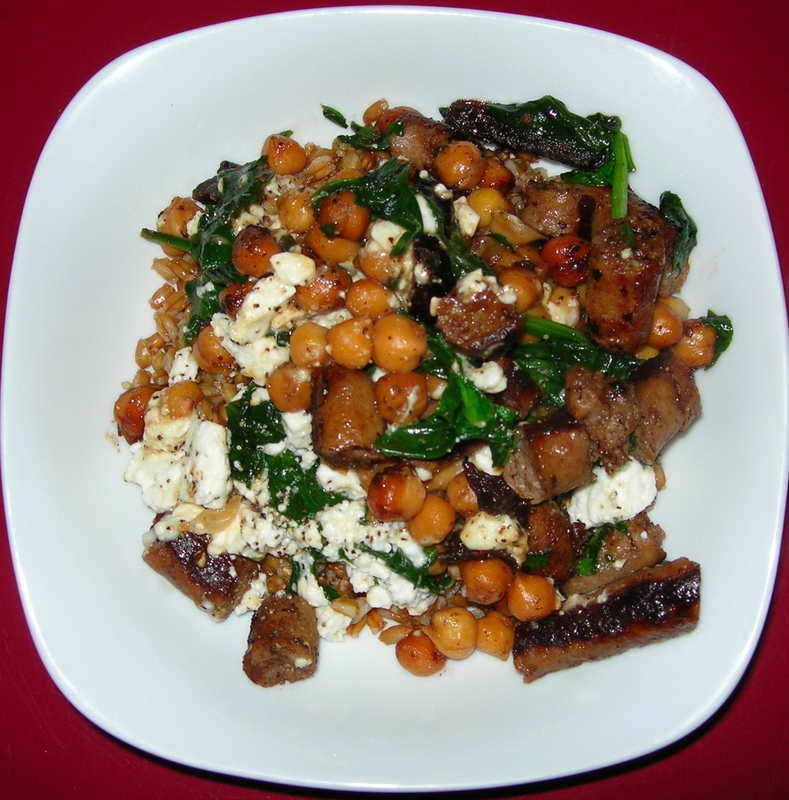 I made the farro and couscous at the same time and after the couscous was done, I stuck it in the fridge overnight to make a salad for lunch the next day. To make the couscous, I poured 1/2 cup of hot broth on top of 1/2 cup of couscous in a plastic container and put the lid on it for 5 minutes. Then I stirred it so it did not stick together. I put the lid back on and left it in the fridge overnight. To make the salad, I took four thin early asparagus and cooked them in simmering water just long enough to be tender. I cut into chunks. While the asparagus was cooking, I chopped up about 1/4 of an onion, chopped up a 2 tbsp of parsley and cored and cut up a Bosc pear. I added a bit of salt and pepper. I added 1 tbsp of seasoned rice vinegar. I shook it on so that is a guess. I added enough to add dress the salad lightly. This is was light, fresh and delicious. The pears and asparagus are amazing together with the seasoned rice vinegar. The onion adds a bit of bite, the parsley a bit of freshness and then the couscous is a great foundation.